Plus, full-sized models can seat up to eight and offer even greater towing capacities. 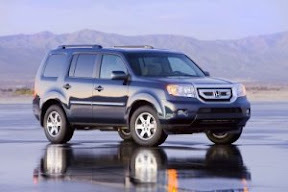 New car SUVs range in price from around 17,000 Dollars to luxury models costing over 60,000 Dollars. Used models can save you significantly as long as you choose wisely. The first major purchase consideration is deciding what size you need: small, medium, or large. For most drivers, a small or medium-sized car-based SUV (aka crossover), such as a Toyota Highlander or Nissan Murano, can provide a good balance of features, fuel economy and function. Be honest with how you intend to use your SUV. For example, if you almost never go off road or tow a trailer, it doesn’t really make much sense to buy a heavy truck-based model (such as a Toyota 4Runner or Ford Explorer), and have the vehicle carry around all that extra weight and hardware that you’ll never use. Plus, truck-based models tend to be thirstier at the pumps than car-based vehicles. As with all cars, safety is a key concern with SUVs. Due to their inherent higher center of gravity, SUVs are more prone to rollovers. When shopping for a used model, check to make sure that it’s equipped with electronic stability control and curtain air bags—two features we strongly recommend. Most 2005-present midsized and large SUVs have these important safety features. To help you narrow the field, we have compiled a list of Consumer Reports recommended used SUVs. These vehicles have performed well in our road tests, have average or better reliability, and have performed adequately if included in crash tests. —Determine your needs. Narrow down your choices between car-based and truck-based models. Car-based SUVs have better handling, comfort, and fuel economy. Truck-based SUVs generally have a rougher ride, but have true four-wheel drive, which is useful for towing and serious off-roading. —Evaluate engine and power. SUVs have a variety of engine sizes, from four-cylinders to V8s. You will also need to determine whether you want two-wheel drive, all-wheel drive, or four-wheel drive. AWD is especially useful if you drive on snow or ice. —Compare fuel economy. The mileage can vary significantly–and made worse with roof carriers, brush guards, oversized tires, and towing. —Check safety features. Many later model-year SUVs have standard stability control and side air bags. A backup camera may also be useful, since the blind spots of SUVs make it difficult to see when backing up. —Take it for a test drive. While many people enjoy the higher seating position of SUVs, some may find it difficult to get in and out and find a proper seating position. Try before you buy to make sure it’s a good fit. Uplevel trims and luxury SUVs typically have seat-height adjustments that may improve comfort. —Look at private sellers for the best price, but make sure you have a mechanic inspect the vehicle before you buy. —Check your insurance. An SUV can be more expensive to insure than a conventional car, so find out the rates before you feel that you absolutely have to have one.